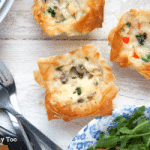 Individual size quiches with a filo pastry case. Preheat the oven to 180C/355F (160C/320F fan assisted). Cut the filo into 5x5 inch (13x13cm) squares. Brush the tray with oil all over the inside of the holes, then line each hole with a filo square. Brush the inside of the pastry sparingly with oil and repeat until you have three layers in each hole, finishing with a light brush of oil. In a jug, whisk together the eggs and milk until fully combined, season with salt and pepper and then pour equally into the pastry cases. Chop all of your filling ingredients into approx 1cm pieces and add to the quiches in any combination you like until the egg level is close to the top. Grate the cheese and place a pinch on top of each quiche, then sprinkle on a little freshly chopped parsley. Bake until the egg for 20 minutes until the filling is just firm and the outer edges of the pastry are golden. If they seem to be browning on top before firming adequately, underneath, cover the top of the tray with a little foil or baking paper and continue to bake. Allow to cool a little before lifting from the tin and checking they're firm underneath - if not, return to the oven for a couple more minutes. If you wish to store them for later once cooked and cooled, place in a single layer in a sealed container and place in the fridge. They should keep well for a day or two.